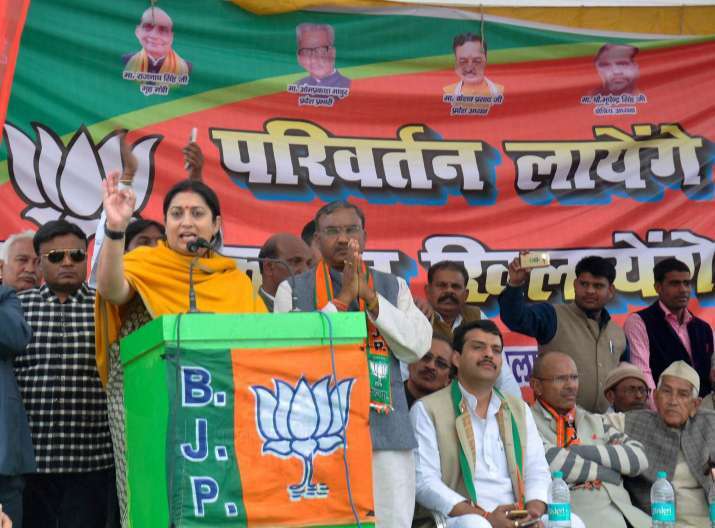 Sharpening her attack on Congress leader Priyanka Gandhi, Union minister and BJP leader Smriti Irani on Wednesday said Priyanka is not campaigning in Amethi as she cannot face people's questions. The Union Textiles Minister addressed rallies and press conference here, where she did not give direct reply when asked if she would be the party’s chief ministerial candidate if it comes to power. Every BJP worker wants that the party forms the next government in Uttar Pradesh, she said on the question of chief ministerial candidate. She said that despite losing the Lok Sabha poll from Amethi in 2014 to Rahul Gandhi she has been working for the people of the constituency. But, Priyanka Gandhi has not gone to campaign in Amethi because of the “unfulfilled” promises, she said. “Priyanka wants to avoid people’s questions,” she said. Asked if SP-Congress alliance has in any way affected the prospects of BJP in the state, she said Chief Minister Akhilesh Yadav went with Congress because he was not confident of a victory alone. On BSP supremo Mayawati’s recent comments on BJP, the Minister said she just wants to “remain in headlines”.